Watch the reels ignite and get engulfed in big wins with Smokin' Hot Gems slot machine online by Everi! This classic 3-reel slot offers 9-paylines and four different jackpot prizes. There are also multiple wild jackpot symbols including the rewarding Diamond Double Wild Jackpot symbol which will multiply your winnings by 2! Watch the reels ignite and get engulfed in big wins with Smokin’ Hot Gems slot machine online by Everi! This classic 3-reel slot offers 9-paylines and four different jackpot prizes. There are also multiple wild jackpot symbols including the rewarding Diamond Double Wild Jackpot symbol which will multiply your winnings by 2! Diamond Double Wild Jackpot Symbol – Three Diamond Double Wild Jackpot symbols on an active payline wins the 1st tier progressive jackpot. Ruby Wild Jackpot Symbol – Three Ruby Wild Jackpot symbols on an active payline wins the 2nd tier progressive jackpot. Topaz Wild Jackpot Symbol – Three Topaz Wild Jackpot symbols on an active payline wins the 3rd tier progressive jackpot. A mix of any three jackpot symbols (Diamond, Ruby, Topaz) on an active payline wins the 4th tier progressive jackpot. 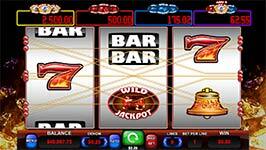 Progressive prizes are not multiplied by Diamond Double Wild Jackpot Symbols.